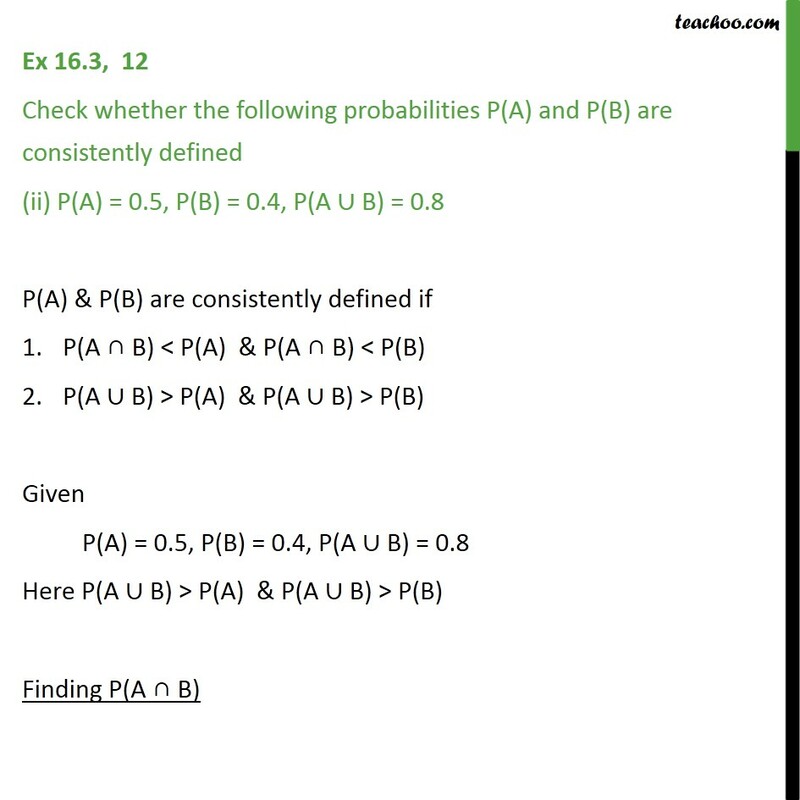 Ex 16.3, 12 Check whether the following probabilities P(A) and P(B) are consistently defined P(A) = 0.5, P(B) = 0.7, P(A B) = 0.6 P(A) & P(B) are consistently defined if P(A B) < P(A) & P(A B) < P(B) P(A B) > P(A) & P(A B) > P(B) Given P(A) = 0.5, P(B) = 0.7, P(A B) = 0.6 Here, P(A B) > P(A). 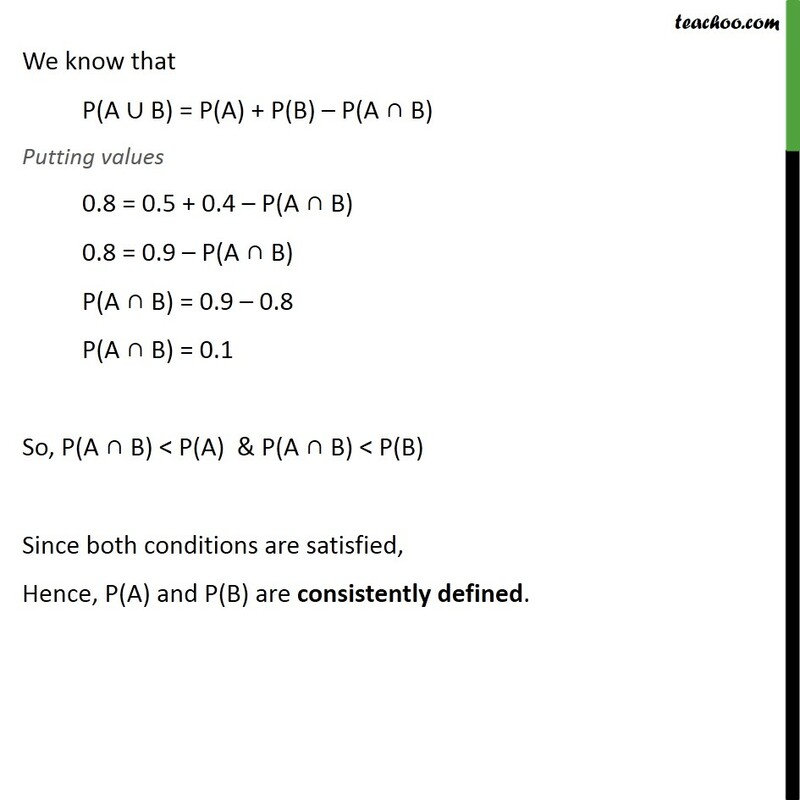 Hence, P(A) and P(B) are not consistently defined. 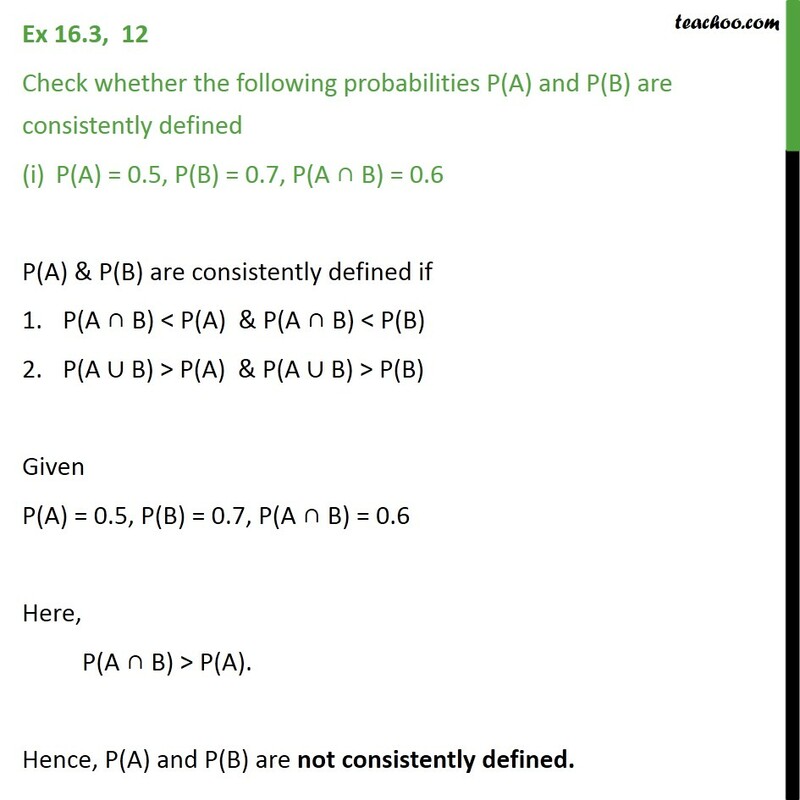 Ex 16.3, 12 Check whether the following probabilities P(A) and P(B) are consistently defined (ii) P(A) = 0.5, P(B) = 0.4, P(A B) = 0.8 P(A) & P(B) are consistently defined if P(A B) < P(A) & P(A B) < P(B) P(A B) > P(A) & P(A B) > P(B) Given P(A) = 0.5, P(B) = 0.4, P(A B) = 0.8 Here P(A B) > P(A) & P(A B) > P(B) Finding P(A B) We know that P(A B) = P(A) + P(B) P(A B) Putting values 0.8 = 0.5 + 0.4 P(A B) 0.8 = 0.9 P(A B) P(A B) = 0.9 0.8 P(A B) = 0.1 So, P(A B) < P(A) & P(A B) < P(B) Since both conditions are satisfied, Hence, P(A) and P(B) are consistently defined.